Paranormal private eye. Grim reaper extraordinaire. Whatever. Charley Davidson is back! And she's drinking copious amounts of caffeine to stay awake because, every time she closes her eyes, she sees him: Reyes Farrow, the part-human, part-supermodel son of Satan. Yes, she did imprison him for all eternity, but come on. How is she supposed to solve a missing persons case, deal with an ego-driven doctor, calm her curmudgeonly dad, and take on a motorcycle gang hell-bent on murder when the devil's son just won't give up? 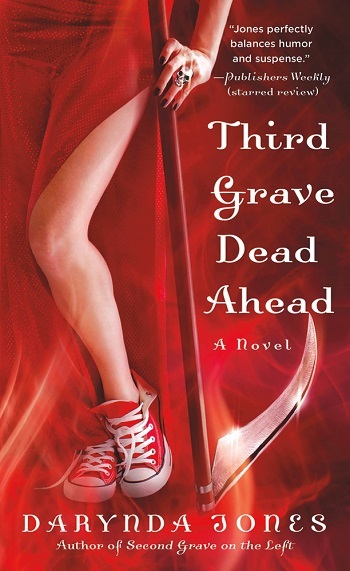 Third Grave Dead Ahead is the third installment of the Charley Davidson series. It shouldn't be read as a standalone or out of series order. However, I suspect once a reader gets the foundation of the series, it would be easy to read later books without confusion. Charley is the grim reaper, and she's dealing with issues on many fronts. The only thing that is guaranteed for this private investigator, someone will attempt to kill her every step of the way. Polar opposites drawn to one another, the son of the devil is angry with Charley, which adds an angsty, yummy bite to the novel. Charley bound Reyes to his corporeal form, which puts a damper on his abilities. But she doesn't know how to unbind him, since there isn't a grim reaper handbook. Solving a case of a missing wife commissioned by the husband she thinks is guilty, Charley is off on a wild goose chase, interconnecting many different cases. It's action and puns on every page, to where I could barely get a breath in there somewhere. Charley is avoiding Reyes by mainlining coffee and refusing to sleep, which is making her emotionally unstable and dangerous to her own longevity. A knife-wielding child ghost, convicts, missing person, the son of the devil, Mistress Marigold's surprising identity, a biker gang, a cuddly watch dog, a BFF named Cookie, a cop family, a hottie on her tail, a mine, and an abandoned asylum, all makes for one heck of a ride. The emotional gut-punches had me flipping the pages quickly, where it comes to love, loss, betrayal, and well-meaning family members. That ending nearly put me on my knees, which was hard to read but I couldn't put the book down. The character growth Charley experienced in the course of a few short chapters was life-altering. Highly recommend this series as a whole. I actually have read half of book four already, simply because I didn't want to put it down to write this review. The next book is even better than the previous one. In this third book, Charley investigates a relatively simple missing persons case while her personal life and Grim Reaper responsibilities get increasingly complicated. The missing persons case in this book feels quite similar to the missing persons case in the second book. Once again, she is looking for a missing wife – only this time she actually suspects the woman’s husband. It’s an engaging investigation but the real excitement in the story is Charley’s search for Reyes’ stepfather. I enjoyed the way Charley and Reyes’ relationship continues to develop and I like the way Charley’s powers continue to develop. Once again, Charley’s friends and relatives are just as entertaining as Charley herself. I love Cookie and there are moments when I felt Charley had better chemistry with Garrett than Reyes. I love Charely’s new biker friends and I’m interested to see where her relationships with her father and uncle will go. Other than a couple of heart stopping twists at the end of this story (that I really didn’t see coming), this series is starting to settle into a comfortable pattern that is already feeling a little bit formulaic. I kinda like the formula – the series feels like a familiar weekly TV drama that I can enjoy without my brain needing to work too hard. I’m already looking forward to book four. In this instalment of the series, Charley is trying her best to avoid Reyes. This means that she really has to try and stay awake. That leads to her basically running off of coffee and sarcasm. The plot is most definitely thickening in this series. The ending of the book was a total WTF moment for me. I really felt for Charley at the end of this book, I can't wait to see how it plays out in the next book. 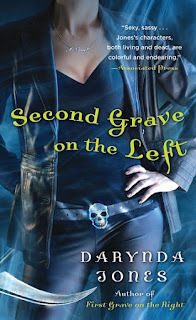 Reviewers on the Wicked Reads Review Team were provided a free copy of Third Grave Dead Ahead (Charley Davidson #3) by Darynda Jones to read and review.